UPDATE, 9 a.m. Dec. 24: Normal Gold Line service has resumed between all stations. UPDATE, 6 p.m., Dec. 23: Bus shuttles continue between Allen and Sierra Madre Villa and will continue for the rest of Friday service. Metro Operations reports that work crews have made progress repairing the second overhead catenary pole damaged by the big rig. Crews are working toward restoring normal Gold Line service for Saturday. UPDATE, 10 a.m., Dec. 23: Additional damage to the overhead power supply equipment was discovered as repairs began. At this time, we estimate repairs to be completed tonight for regular service on Saturday. Currently trains are running every 10 minutes between Sierra Madre Villa and APU/Citrus in Azusa, and every 15 minutes between Allen and Atlantic Station in East L.A. Bus shuttles are in service between Allen and Sierra Madre Villa Station, customers can board buses across from Allen Station on the nearside of Corson/Allen and at Bus Bay 3 at Sierra Madre Villa. This will be the service plan throughout today and Saturday until further notice. UPDATE, 5:04 p.m.: The big rig blocking both tracks between Allen and Sierra Madre Station has been removed and Metro has assessed the damage to the Gold Line’s overhead power supply system. Repairs are ongoing and expected to continue Friday. We should have an update on the work later this morning. Trains are set to run every 10 minutes between Sierra Madre Villa and APU/Citrus and every 15 minutes between Allen and Atlantic. Morning commuters can expect bus shuttles to continue to replace train service between Allen and Sierra Madre Villa stations. Trains are set to run every 10 minutes between Sierra Madre Villa and APU/Citrus and every 15 minutes between Allen and Atlantic. For live updates, check metro.net or follow Metro on Twitter @metrolosangeles or @metroLAalerts. Update, 3:51 p.m.: Bus shuttles continue to replace train service between Allen and Sierra Madre Villa stations. Customers requiring service between the incident area can board buses across from Allen Station on the nearside of Corson/Allen and Bus Bay 3 at Sierra Madre Villa. Update, 1:32 p.m.: Bus shuttles continue to replace Gold Line service between Allen and Sierra Madre Villa stations. Trains are running every 15 minutes between Allen and Atlantic and every 10 minutes between Sierra Madre Villa and APU/Citrus. California Transportation Agency is also reporting that a crane is currently on scene working to remove the big rig from the Gold Line tracks. The HOV and two left lanes of the eastbound 210 freeway will remain closed until further notice. Update, 11:24 a.m: Metro bus shuttles are now in service between Sierra Madre Villa and Allen Station, arriving every 10 to 15 minutes. Across from Allen Station, shuttles will pick up customers on the nearside of Corson Street and Allen Avenue. For live updates, check metro.net or follow Metro on Twitter @metrolosangeles or @metroLAalerts. Update, 9:37 a.m.: Bus shuttles continue to replace Gold Line service between Lake and Sierra Madre Villa stations. Trains are running every 15 minutes between Lake and Atlantic and every 10 minutes between Sierra Madre Villa and APU/Citrus. California Highway Patrol is also reporting the HOV Lane on the eastbound 210 freeway near Sierra Madre Blvd will be closed until further notice. The incident is still under investigation, and we will provide more service details once the damage has been evaluated. Update, 7:32 a.m.: Bus shuttles remain in service between Lake and Sierra Madre Villa Station while authorities investigate the earlier truck accident. Customers requiring service between the incident area can board buses at Lake Station on Lake/Maple and Bus Bay 3 at Sierra Madre Villa. Gold Line trains are running with up to 15 minute delays at this time. Metro Gold Line service between Lake and Sierre Madre Villa station is currently suspended due to big rig crash on the eastbound 210 freeway near San Gabriel Boulevard. The truck is blocking both tracks between Allen and Sierra Madre Station and has damaged parts of the Gold Line power supply system. All Pasadena-bound trains will end at Lake Station and turn back to Los Angeles. All Los Angeles-bound trains will end at Sierra Madre Villa. Bus shuttles are in service between Lake, Allen and Sierra Madre Villa stations. Please allow extra time to travel through the affected area. We will continue to provide updates here at The Source. For live updates, check metro.net or follow Metro on Twitter @metrolosangeles or @metroLAalerts. Related: earlier this year, the Metro Board approved $11 million in funding to do the environmental and design work on raising some or all of the barriers between the 210 freeway and the Gold Line tracks. Here’s the staff report. Those planned improvements to the barriers need to happen sooner than later. Either that or make those drivers on the freeway slow down. Seriously, this happens too many times and God forbid a fully loaded big rig hits a fully packed rush hour train. Seriously, this doesn’t happen on the Green line. Whats with drivers on the 210? There is a fence on Interstate 105 that keeps vehicles from entering the Green Line. Why CalTrans prevented Metro from building a similar barrier along I-210 when the Gold Line was being built is beyond me, but then I really don’t understand traffic engineers all that much. Seriously, I really hope the barriers get improved here soon enough. What confuses me the most though is that fact that the fact that why tougher barriers weren’t even considered on the Gold Line in the first place during the planning process?? The 210 has never been a stranger to truck traffic at all. Can Metro please have staff at the stations to direct people to the bus shuttles and answer questions? Often times Metro would just leave riders to figure out where the shuttles are without any directions. It’s cold and wet today–no one wants to wander around confused. Just came off at Sierra Madre and there was a worker telling us exactly where to go. I was definitely grateful. The Green Line has more exposure to fast driving cars on the freeway, yet has significantly less of these type of situations where cars/trucks end up on the rail tracks. Why is the Green Line much safer in this regard and can we replicate that on the 210 with the Gold Line? That’s a great question. If you do street view on Google Maps you can see the barriers along Green Line are similar to Gold Line. The Caltrans data — http://www.dot.ca.gov/trafficops/census/docs/2015_aadt_truck.pdf — shows there isn’t a huge difference in the number of trucks that use the 105 versus the 210. As someone who lives in Pasadena, I suspect the difference is road design. I am not a traffic engineer, but my personal opinion is that the 210 through Pasadena is very poorly designed with too many on- and off-ramps in close proximity that cause a lot of weaving, with the problem more pronounced on the westbound side. Throw in a lot of trucks and some foul weather and you have a problem. It’s worth noting that the two crashes this year both came during wet weather. Again, just my opinion. Thanks for the timely alerts and updates on your Social Media accounts. I was able to avoid being late to work by taking alternative public transportation! Silver Line out of El Monte safe the day! 1. The 210 has some significant curves in the area where these wreck have occurred. Overall the 105 has curves that are less significant. 2. The 105 has more ‘local’ truck traffic. It goes through the city and not so much around it and tees 90 degrees at both ends. The drivers are more familiar (on average) with the road. The 210 has much more thru traffic (those coming in from the 40 or 10 and heading toward the 5 North (and the reverse). These are less familiar with the curves, more likely to be running at night, likely to be going faster [my observation] (remember energy is 1/2 mv^2) [thus more likely to break through the divider], more likely to be pushing it (driving while sleepy, etc.). There were several jackknife accidents on the 210W to 210W transition road (near to these accidents involving the Gold line) when the weather got wet (same kind of conditions), and at night (same time of day), some of the wrecks were fatal. Caltrans has added flashing lights on a trailer during storms in the area and the problem has stopped. IIRC, all the wrecks involved non-local drivers. I think that there are other factors, but I am not a traffic engineer and don’t have the data to support the ideas. Sounds like reasonable educated guesses! Over the weekend I drove the area of the wreck. The area of the breach was right where the point of impact would be if the truck driver was in either of the right 2 lanes, fell asleep, failed to turn, and went straight. This correlates with my earlier curvier 210 vs straighter 105 idea. Post says “All Pasadena-bound trains will end at Lake Station and turn back to Los Angeles.” Shouldn’t it say all AZUSA-bound (Citrus/APU station) trains? Pasadena (Sierra Madre Villa station) has not been the terminus of the line since March of this year. Perhaps it might be less confusing if Metro would use their own system location and directional landmark descriptors? …and better noise mitigation at the stations please. Pretty please! Was this a problem when the Santa Fe used the same medium? 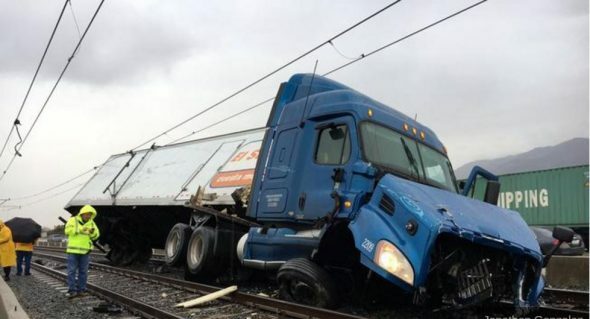 It’s not the first time that semi truck incident disrupted the gold line services during the rainy day. A strong barrier is absolutely needed along the gold line in 210 section, especially between Allen and SMV station in order to prevent this kind of incident again and service suspension. Many idiot truck drivers don’t know how to driver probably on the road, and they cause many delays on the road. might have a head on collision & many passengers would be killed. A HIGHER CONCRETE BARRIER maybe? That wall is very low. Truck tires probably roll right up it OR truck (with high center of gravity) is essentially “tripped” and easily falls over it onto the other side. Injury or death is certain for metro passengers until something is done. What is this the 3rd time? The reader boards at LAUS were stating yesterday, December 26th, that the bus bridge was still (again?) in effect, which caused me confusion and concern until I cleared it up. Metro needs to make sure that expired service messages do not appear on the station information screens after an event has cleared.